Diabetes is no longer an unfamiliar disease. It is probably the most talked about ailment in Bangladesh. Every year, the number of patients affected with diabetes is increasing. It is a chronic condition that arises when the islets of Langerhans cells of the pancreas fail to produce adequate amounts of insulin, a hormone that regulates the blood sugar level of the body. Without insulin our body cannot utilise the energy it needs from food. The food that we consume is mostly turned into glucose, a form of sugar, to convert into forms of energy necessary for the body. Insulin enables our muscles and tissues to absorb glucose from the blood. When the body produces very little or no insulin, the sugar cannot be utilized. This can lead to abnormal blood glucose levels. High blood sugar levels can in effect damage the kidneys, the eyes, and the nervous system. Diabetes can generally be classified into two types. Patients suffering from Type I diabetes make little or no insulin, while although Type II patients make some insulin it can not be properly utilised. A recent study showed that the prevalence of diabetes in Bangladesh is estimated to be 5.6%, where Type II is 96% and type I is about 1% within the adult population. 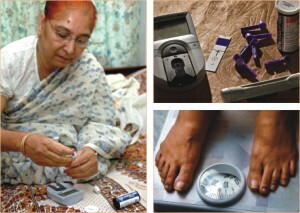 Almost three million people have diabetes in Bangladesh. Because of its chronic nature, it can damage any part of our body. The only possible remedy is to fight against it by controlling the level of sugar in our blood as closely as possible, through maintaining strict dietary regulations, intake of drugs (if necessary) and a disciplined way of life. Glucose level higher than the normal will cause hyperglycemia, while low levels cause hypoglycemia. Exercise is a must for people with diabetes as it can help the body absorb the sugar in blood, resulting in a lower sugar level. Additionally, it helps people reduce anxiety and make them feel good about themselves. Eating habits should also be changed. Well regulated diet ensures a relative control on the sugar level of the blood. It is important to learn how the food consumed effects diabetes and thus ensure good health. “When I first tested for diabetes back in 2005 it was found that I had a very high sugar level. Soon I was diagnosed of having Type II diabetes. I had many complicacies: as severe pain in both shoulders, blurred eyesight, and weight loss. Soon afterwards, I stopped smoking, started exercising and switched to all the rules that my doctor had suggested and from what it seems now, an unruly lifestyle. Within a few months the sugar level lowered drastically.” Says Momunul Hoque, a retired service holder. When asked how he maintains good health, Hoque informed that his day starts early, with a walk in the park followed by free hand exercise. He adds, “Diabetes depends entirely on control. You need to do regular exercise and avoid intake of sugar directly. I do not intend to give up my fight against diabetes. Hopefully I will be able to continue a healthy life in the years to come”. Living with diabetes is not a curse; it is just a disease that demands a disciplined life, with maintenance of balanced diet and some form of exercise. For some, drugs are essential. But in no way is it beyond human control.